Earn $6.29 in Rewards credit (629 points) What's This? 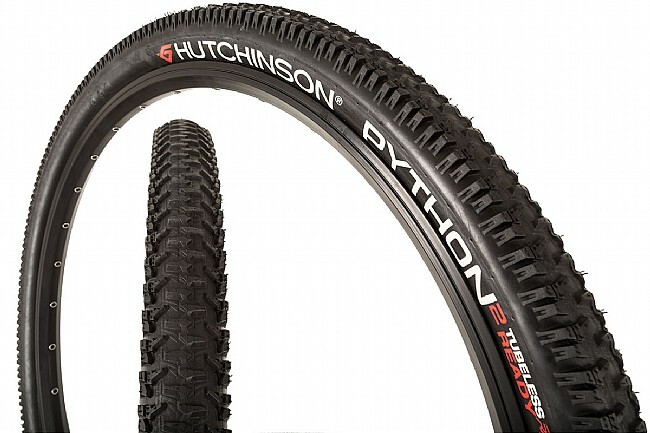 The Hutchinson Python XC tire has spent the last several years putting multiple World Champions like Julien Absalon through the line first, and now they've updated this distinguished tire for even more performance on loose, dry, or rocky terrain. The low profile center knobs on the Python 2 have an almost continuous center line for quick rolling while chamfered edges give consistent braking. The pistol transition knobs that made the original Python so desirable are still present on this second iteration for constant traction through cornering. Tall side knobs let the tire bite in at sharp angles or heavy deformation, and the triple compound construction uses a harder durometer rubber base to better support the tackier rubber used for the knobs.